When DH visited Tom’s Kitchen last year and had some excruciatingly bad Fish and Chips we pondered on whether his new place Tom’s er…Place would be as bad. Today I found out – it’s worse. Listen, if you’re going to get yourself so much pre-publicity – and TA’s mug has been plastered all over the place of late – then at least put out an honest and decent product. The restaurant wasn’t open (natch) when I visited so I ordered some Fish, Chips and Mushy Peas to take away. Then I went to try and find somewhere to sit and eat them. Not an easy task in SW3 where most green spaces are private enclaves for the great and good of Chelsea and most benches are taken up by nannies of the sprogs of the great and good. Eventually I found a wall to perch on and unwrapped my bounty. First thoughts were that it was a pretty small piece of Cod for £11.50 (and it will cost more in the restaurant) and the chips looked suspiciously like the fat variety which I loathe so much. Yup. Correct on both counts. The Cod had an overcooked tough batter (I have a suspicion it may have been one of the pieces I’d seen sitting in the display cabinet). Because the tranche was quite thick the fish hadn’t been turned to mush, but it wasn’t far off. It tasted ok. The chips were rubbish: flaccid and undercooked in the centre, they really needed another deep frying. I left most of them to the pigeons who seemed to enjoy them a lot more than me. No taste them pigeons. I had noticed that the chefs doing the frying looked bored and distracted but I would have expected a bit more enthusiasm given this is a brand new venture. Perhaps they were taking it easy for the restaurant opening proper. Perhaps they just couldn’t give a toss. 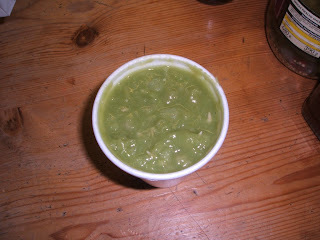 English Mushy Peas - as oppose to the well known French variety - were ersatz but harmless. Southerners are never going to get these right so it’s pointless going on too much about it (but I probably will anyway). I’ve posted a picture of the proper stuff so you can find the relevant picture in your I-SPY Northern Chippies (assuming you’re old enough to have a copy). And just when I thought things couldn’t get any worse I tried the condiments. For your quid you get a couple of tiny containers. One contained a tomato reduction which they amusingly refer to as ‘ketchup’ (the wags), the other had a rather acidic and nasty tartare sauce. So then, overpriced (Chip Buttie for £3 anyone ? ), crappy Fish and Chips. Surely, there must be some upside. Nope. Nothing. Nada. In common with DHs’ experiences at TA’s other restaurants there is absolutely no reason for us to revisit this one. Oh and here's the sustainability bit for those who give a toss: the knives and forks are made out of wood or something and are designed by Terence Conran (I made that last bit up). I thought my first experience of Restaurant TA was the time when I realised how much I disliked his cooking, but, a friend has just reminded me of the abominable meal we had when he was cooking at Pied a Terre. I had better looking f&c from my local chinese/chippie last night. And what a tight portion. He's just another chef/restrauteur that punters buy in to for some reason, allowing him to take the piss. Do you think he really gives a monkeys about sustainability or is he using it as an excuse to serve this crap at sky high prices? I know which camp I'm in. Still I expect all the "critics" will love it. You see, I think that TA is to be admired. He is obviously taking the nations obesity problem very seriously and cutting portions to Lillipution sizes. He must be having a good giggle at everyones expense. Haha that cod looks like half the size I'd get somewhere decent (like the Swan in Southport - http://cheesenbiscuits.blogspot.com/2007/03/just-in-case-you-thought-this-was-kind.html) and costs twice as much. Weight for weight (and including condiments), that makes the TA fish & chips about £25, a full 5 times more than you pay up north. Bleedin' nora. All hype and no substance, then? Soooo disappointing after the big build-up to this particular opening. Thanks for saving me the trip!